July 28 Update: The Amazon Fire Phone release date has come and gone, so if you're a US citizen you can up and buy the handset right now. Be sure to check out Page 2 for an Amazon Fire Phone vs iPhone 5S vs Samsung Galaxy S5 vs LG G3 showdown to see which handset is right for you. It's here! Meet Amazon Fire, the etailer's very first smartphone. Anyone out there nail its name? Know what else is here? Our Amazon Fire Phone review! The Amazon phone is about what we expected on the spec front, but it's loaded with two features that Amazon claims help users "see and interact with the world through a whole new lens." Those features are Dynamic Perspective and Firefly, which we breakdown further below, plus plenty of details on everything else the Amazon phone has to offer. Perhaps the biggest takeaway from Amazon's phone event, besides the eye-catching 3D (which doesn't necessarily mean customer-catching), is the phone's heavy ties to buying. Amazon wants you to purchase things, and now it's come up with a way for you to do so from your pocket. What are your thoughts on Fire? Is it everything you were hoping for and more? Or a let-down that can't hold a candle to the iPhone 5S, Galaxy S5 or other flagship devices? Is Amazon simply trying to sell you more stuff, or looking like it legitimately wants to succeed in the smartphone space? The Amazon phone costs $199.99 (about £117, AU$213) for a 32GB version and $299.99 (about £176, AU$320) for 64GB. Off contract, Fire costs $649.99 (about £382, AU$691) and $749.99 (about £441, AU$798), respectively. The Fire Phone is an AT&T exclusive, and it's shipping now. Order it on Amazon.com or AT&T.com, or walk into an AT&T store to pick your new handset off the shelves. AT&T customers with a Next early upgrade package can get away with paying $32.50/month for 20 months on Next 12 or $27.09/month for 24 months on Next 18 for the lesser storage flavor. A 64GB runs $37.50/month for 20 months on Next 12, while a next 18 option costs $31.25 for 24 months. As an added bonus, customers who buy the Fire phone are being treated to 12 months of Prime membership free, but the offer is only running for a limited time. We're still lacking early sales figures, but don't expect Amazon to panic if its first phone turns out to be a flop. CEO Jeff Bezos told The New York Times: "We have a long history of getting started and being patient. There are lot of assets you have to bring to bear to be able to offer a phone like this. The huge content ecosystem is one of them. The reputation for customer support is one of them. We have a lot of those pieces in place. It's our job to keep inventing and to be patient. One thing leads to the next." In other words, the pieces are there for long-term success, Bezos believes. It's just a matter of sticking it out with the phone until it reaches that point. The device features a 4.7-inch screen, a size ideal for one-handed use, said CEO Jeff Bezos. It ranks with 590 nits of brightness and other goodies like an ambient light sensor and Dynamic Image Contrast to make your screen images sing in various viewing situations. The resolution sits at 1280 x 720 with 315ppi. Gorilla Glass 3 is slathered on the front and back, the buttons are made of aluminum and stainless steel details and a rubberized polyurethane grip make for a chic profile. On the inside, the Fire Phone features a quad-core Qualcomm Snapdragon 800 2.2GHz processor, Adreno 330 graphics and 2GB of RAM. As expected, the Fire runs a forked version of Android, Fire OS 3.5.0. As for cameras, we know it's fixed with a 13MP snapper on the rear, complete with OIS and a powerful f/2.0 lens. There's even a dedicated camera hardware key - press once to turn it on, twice to take a shot. Amazon is throwing in free unlimited photo storage on Amazon Cloud Drive to sweeten the deal. The front camera - the normal one - is a 2.1MP-er. Both it and the rear camera can capture video in 1080p. Dolby Digital Plus surround sound speakers crank out the Fire Phone's audio. The Fire phone features global LTE and connectivity on nine LTE bands, four GSM bands and five UMTS. It features 802.11ac support, Wi-Fi channel bonding, Bluetooth and NFC. Note this is regular Bluetooth and not the LE kind that makes for wearable connections. We suspect the device is going to need a lot of juice to run its 3D features, and Amazon only managed to put a 2,400mAh battery in to fuel the Fire. The company said in release notes that the Fire has 285 hours of standby time, up to 22 hours of talk time, up to 65 hours of audio playback and up to 11 hours of video playback. But running Dynamic Perspective and extensive testing is needed to see if these numbers are attainable. Finally, a nanoSIM is pre-installed and the phone has space for a microUSB 2.0 and 3.5mm headphone ports. In the days leading up to the Fire Phone's release, Amazon made it be known that developers are flocking to flush out the phone's software offerings. "In the week following the announcement of the device, the Appstore received more app submissions than any other weeks since it opened in 2011," the company said in a press release, noting developers are taking advantage of the Dynamic Perspective SDK and Firefly SDK in their apps. Companies like eBay, Groupon, Kik, Sega, Trove, TV Guide, the Wall Street Journal and WhatsApp are already using Dynamic Perspective and Firefly, Amazon said. 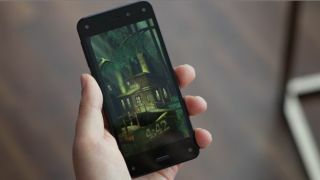 Other apps and games that will be available on the Amazon phone at launch include AirBnB, Angry Birds Epic, Badland, Cut the Rope 2, FOX Sports Go, The Room Two, ToDoist, Where's My Water 2 and Wunderlist. The likes of Facebook, Instagram, Pandora, Pinterest, Spotify, Stubhub, Uber and WhatsApp are ready to rumble when the Fire Phone ships, too. Amazon Game Studios is also serving up two Fire Phone exclusive titles in collaboration with other game makers. Saber's Edge and To-Fu Fury both use Dynamic Perspective as part of their game play, letting users peek around corners and objects inside the game, control gameplay with head movements and tilt the device to change direction or their view. Microsoft made quite a big deal July 22 that Skype is headed to the Amazon Fire Phone. The app will be available at launch and will adopt some of Fire Phone's flare, complete with a 3D icon and notification badge. Thanks to a carousel widget, users can see chats and notifications at a glance, meaning they won't have to launch the Skype app to stay on top of their conversations. The Redmond firm also came out July 24 with word that its OneNote note-taking and to-do list app is now available for the Fire Phone and Kindle Fire tablets. OneNote is free on the Amazon Appstore for Android. Unlike Skype, OneNote for Fire Phone isn't optimized for the device - it's just the regular Android version available on a new phone. Also available for the Fire Phone is Slacker Radio, a music application. The app uses the Amazon phone's tilt controls, letting users learn more about a song, find similar artists and access recently played tracks. The Amazon phone screen has an interface called Dynamic Perspective that adjusts a 3D-like view of the screen to match users' head position. Lockscreens and wallpapers have a 3D effect, though that's not all. Bezos demonstrated on stage how the device could render a building on a map in Dynamic Perspective. The building - the Empire State, to be exact - was rendered in a three-dimensional sort of way and moved as the user moved. It was a neat trick of animation, though not the reach-out-and-grab 3D of our youth. Neatly, in maps, you can tilt the phone to see what's "tucked" information that lives on another layer, like Yelp ratings and reviews, and see under and around edges. The fun doesn't stop there. Fire Phone also lets you one-handed tilt through a line-up of items you may be shopping for, like women's dresses, in the Amazon Shopping app. You can also auto-scroll through an article, a web browser or ebooks, and tilting in Amazon Music reveals song lyrics. And Dynamic Perspective seems acutely tuned to games, making the images you see on screen pop out and forcing you to maneuver around them just by moving your head. Dynamic Perspective is good at recognizing what's a human head and what's not, and there will even be an SDK for the feature so app developers can 3D-ify their games and offerings. Bezos explained onstage in Seattle that in the early days of the Fire Phone, Amazon went so far as to make its own headset to emulate 3D effects. That's not really practical for real-life, Amazon concluded, which is perhaps a little jibe at Google Glass. To solve the 3D issue, Amazon did indeed stick four front-facing cameras on each corner of its phone. No matter what angle it's being held at, two cameras will always be facing the user, Bezos claimed. They are of the infrared variety - ultra-low power, Amazon swears - so they work in darkness. The Dynamic Perspective system also relies on four infrared LEDs on the front to compliment the cameras. The Amazon phone is full of little touches, like swipes, to make it easier to use. Bezos and Co. seem very keen to make the Fire Phone as user-friendly as possible, probably hoping to keep their customer satisfaction rankings cozy in their No. 1 slots. Following in line with the Kindle tablets, the phone features a dedicated Mayday button to connect to customer support. It will work over Wi-Fi, 3G and 4G, and is free. Because video is so tied to the Amazon experience, the company has included a number of video features with its first handset. IMDB's X-Ray is headed to the Fire Phone, and Second Screen lets uses Miracast video from their Fire phone to their Fire TV. ASAP, another Fire TV feature, is also making it to its phone-y cousin. The Kindle Store, Audible, Kindle Newstand and the recently purchased Comixology are accessible on the phone. Taking advantage of Amazon's digital content library, the Fire provides "instant access" to over 33 million songs, apps, games, movies, TV shows, books, audiobooks and magazines. Prime members will get unlimited streaming access to movies and TV episodes at no extra chard. The same sort of deal applies to Kindle Owners' Lending Library and Prime Music members. An enhanced carousel features "active widgets" that show you the last several messages, emails or alerts in your various communication and organization apps. The info pops up right on the home screen and users can deal with it without ever wandering away. Third-party apps can come up with their own uses; USA Today flashed headlines that are relevant to a user while Zillow popped up property information based on location. The Music app features a "three-panel design," with the left for navigation, the center for various controls and the right with lyrics. Amazon also unveiled something called Firefly. By pressing and holding a dedicated button, the Fire Phone can recognize printed phone numbers, email and web addresses, business cards and much more. Firefly even works at a distance, so you can capture a phone number on a sign from across the street, for example. The idea is to be able to send an email, make a call, save a contact or go to a website without having to type it all into your phone. It doesn't stop there though; Firefly can also recognize songs, TV episodes, art, magazines, movies, music, QR codes and bar codes. iHeart Radio and StubHub build their own apps with the Firefly SDK to make it easier for customers to start a new radio station or find concert tickets. Users can pull up info on items like books or a painting, potentially making it a handy information tool. By the numbers, Firefly recognizes 245,00 movies and TV episodes, 160 live TV channels and 35 million songs. It can supposedly ID 70 million items (over 100 million all told), such as books, DVDs, video games and CDs, and even work around issues like folds, glare and curves. Users can then read product details for these items, add them to their Wish List, and order them on Amazon.com. Translation - it's easier to buy things with the Fire Phone. Amazon is releasing an SDK for the feature, meaning third-party developers can take advantage of its item-recognition abilities in their apps, too. The SDK is available immediately.